Cool River is a staple steakhouse and seafood restaurant in this area. The restaurant celebrates its 20th anniversary this year and decided to launch a new brunch menu (why not, right?). The 10-item brunch menu joins 17 additional lunch items that are served every Saturday and Sunday from 11 a.m. to 3 p.m. Take a look below at the drool-worthy pics below! Enjoy $5 Bloody Marys and mimosas while dining in for brunch. Select beers and wines are just $5 too! 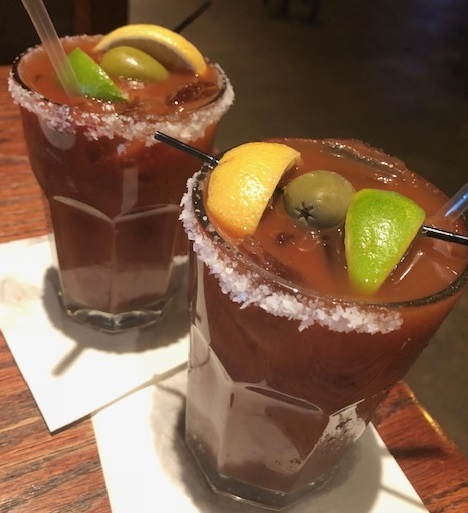 The $5 Bloody Marys pictured above are mixed with Svedka and garnished with olives, lemon and lime. 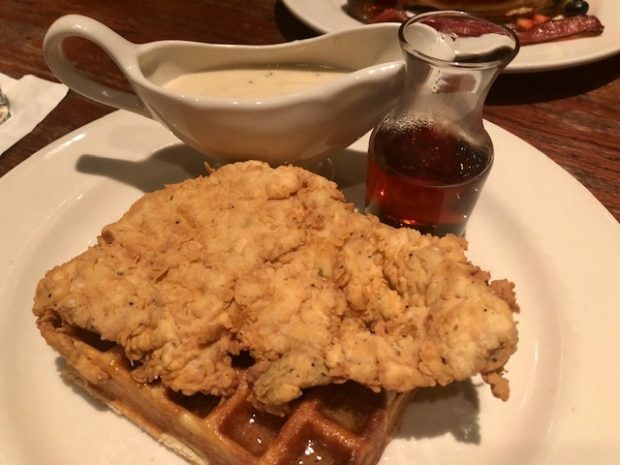 This Texas-sized chicken and waffles puts other similiar dishes to shame. The fried chicken breast rests on top of a Belgian waffle with cinnamon brown sugar butter, maple syrup and gravy. Priced at $15.95, this is the highest-priced brunch dish here, but it’s not bad since it’s a huge entree. I took the rest home and ate it later (I couldn’t let this deliciousness go to waste). But if you finish it one setting, good for you! It’s also to see both gravy and syrup come on the side, so you can take your pick or have both! If you want a traditional item, order the blueberry pancakes. 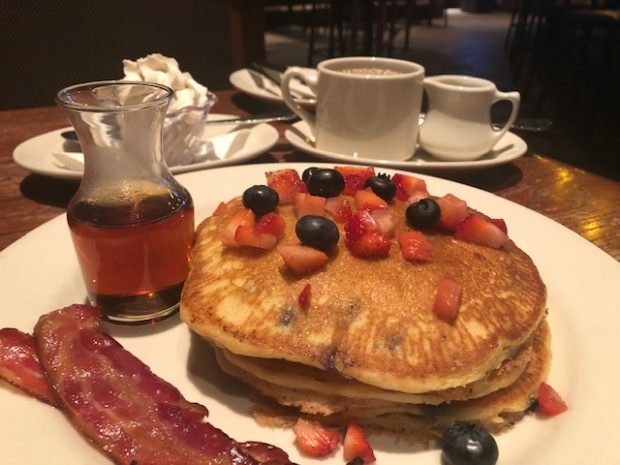 These three large pancakes comes with strips of Nueske’s bacon, maple syrup and Chambord Mascarpone cream. It’s only $10.95 and will leave your belly satisfied. 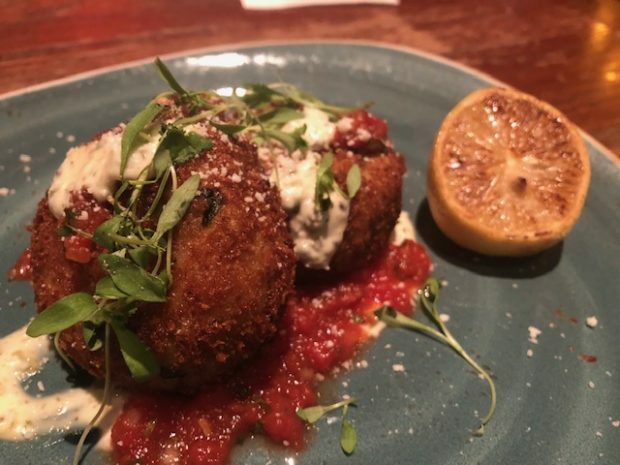 Enjoy additional brunch dishes like the crab quiche, paleo hash, eggs benedict and more. Cool River Cafe is located at 1045 Hidden Ridge, Irving, Texas 75038. Next time you find yourself around Irving, or want to drive up there for a GOOD brunch, go check it out!